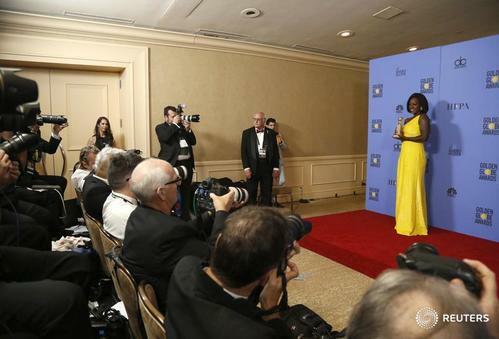 See live photo coverage from the red carpet as award season gets underway with the 74th Golden Globes. 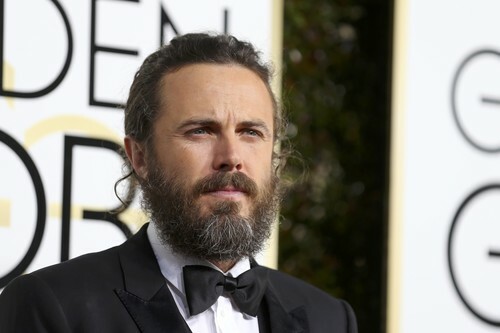 Actor Casey Affleck stole the spotlight early tonight when he donned a long beard and a man bun on the red carpet - and admitted that even he was embarrassed by his new hairstyle. "I feel like I've got chicken pox on the day of my wedding," Affleck, who was nominated for best actor for "Manchester By the Sea", told NBC. "It's not a great look." Two wins for 'La La Land' already, for Best Original Score and Best Original Song. You can hear 'City of Stars' here. Viola Davis dedicates her #Fences #GoldenGlobes win to her father, "he had a story, it deserved to be told and August Wilson told it." 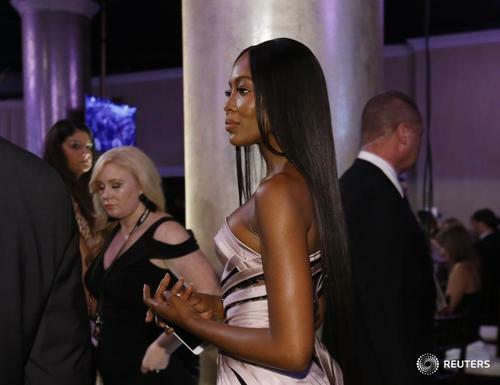 Comedy "Atlanta" and "black-ish" actress Tracee Ellis Ross were among early winners at the Golden Globes on Sunday in a show marked by surprises and digs at the election of Donald Trump as U.S. president. 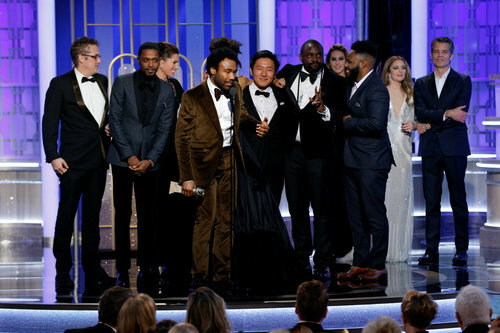 Hip hop show "Atlanta" won the coveted best TV comedy series prize in its first season, beating old favorites including "Veep" and "Transparent." "This is incredible," said "Atlanta" creator and lead actor Donald Glover. "We didn't think anyone was gonna like this show so we really appreciate it." Ross, a first-time Golden Globe nominee, was named best comedy actress for playing the mom in African-American family comedy "black-ish." First-time host Jimmy Fallon welcomed the A-list audience and TV viewers to tonight's ceremony, calling it "one of the few places left where America still honors the popular vote." 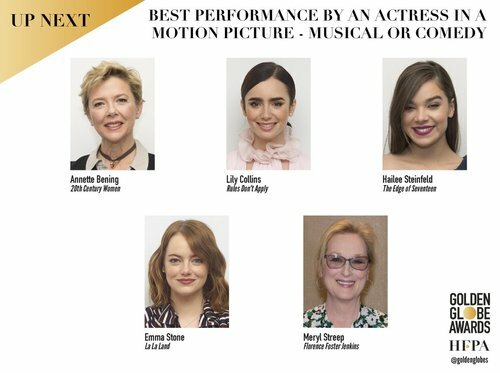 Ballots for the awards in film and television, Fallon, quipped were tabulated by accountants "Ernst and Young and (Russian President Vladimir) Putin." 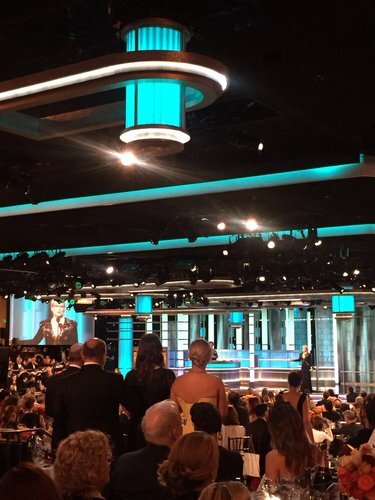 As expected, the Golden Globe for best limited TV series went to "The People v. O.J. 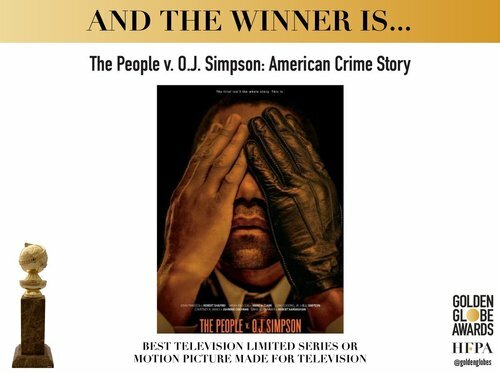 Simpson; American Crime Story," whose behind the scenes dramatization of the 1995 double murder trial of the disgraced football player has won a slew of other awards. Sarah Paulson took home the award for playing prosecutor Marcia Clark. 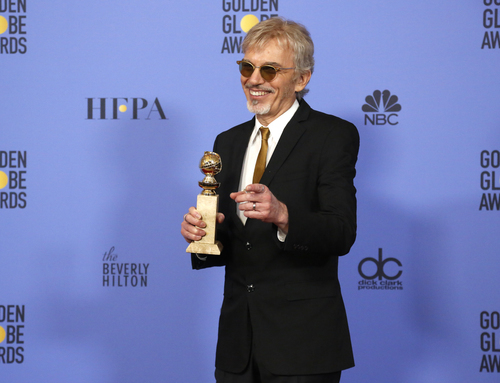 Billy Bob Thornton won the supporting TV actor prize for a down and out lawyer in "Goliath." Aaron Taylor-Johnson pulled off an upset for his breakout supporting role as a gang leader in the thriller film "Nocturnal Animals." For the most part, female stars in shimmering silver and bold bright colors dominated the red carpet for the night. Heavily pregnant, actress Natalie Portman opted for a bright yellow dress cut for the 1960's, a nod to her role as First Lady Jacqueline Kennedy in the biopic "Jackie." "La La Land" star Emma Stone wore a blush-pink Valentino dress embroidered with silver stars, a homage to the film's "City of Stars" song, and led a cavalcade of actresses in different styles of silver. "Loving" star Ruth Negga spun a futuristic look in a fitted metallic Louis Vuitton dress. "Lion" star Nicole Kidman wore a sheer Alexander McQueen gown with silver sequin embroidery, and Drew Barrymore was draped in a shimmering silver-and-white Monique Lhuillier gown. "Stranger Things" newcomer Millie Bobby Brown, 12, opted for a shimmering Jenny Packham cocktail dress. The bold bejeweled hues that dominated the spring/summer 2017 collections on the runway also found their way onto the red carpet. Brie Larson went for red in a Rodarte gown. "Miss Sloane" star Jessica Chastain wore a periwinkle Prada dress, while "Edge of Seventeen" lead actress Hailee Steinfeld opted for a flowing lilac Vera Wang gown. Spinning a twist on the classic black dress, "Arrival" best actress nominee Amy Adams won early praise from fashionistas for her black sequined Tom Ford gown, while Blake Lively opted for a figure-hugging Atelier Versace plunging black gown accented with gold sequined neckline and pocket details. 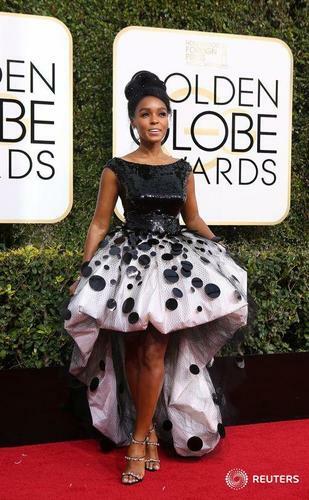 Kristen Bell opted for a sequined black Jenny Packham gown with a plunging neckline, and Janelle Monae split critics with her black-and-white high-low skirted Armani dress. 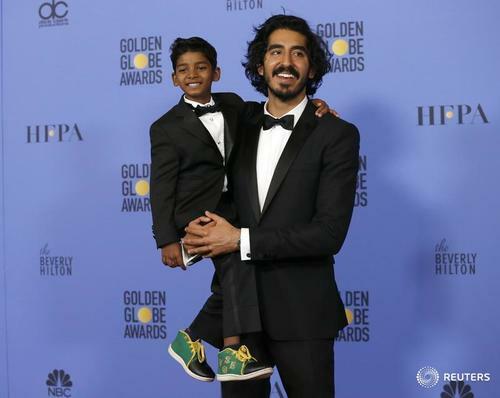 "The Crown" won the Golden Globe award on Sunday for the best television drama series. The new Netflix series about the early years of the reign of Queen Elizabeth II beat hit HBO medieval fantasy series "Game of Thrones," the HBO sci-fi series "Westworld," NBC family drama "This Is Us," and Netflix's "Stranger Things." Hollywood is crawling with outsiders and foreigners...if you kick them all out, you'll have nothing to watch but football and mixed martial arts." 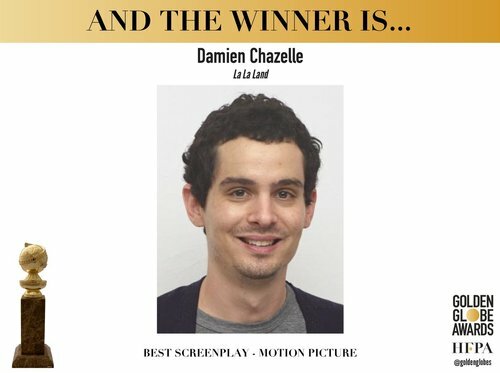 "La La Land" danced off with four early Golden Globes tonight. 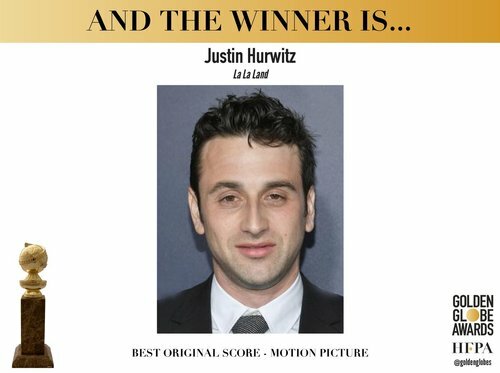 The romantic musical about a struggling actress and a jazz pianist trying to make it in Hollywood took home Globes for Ryan Gosling as best actor, as well as for its screenplay, score and original song. "This is for musical theater nerds everywhere," said songwriter Justin Paul. 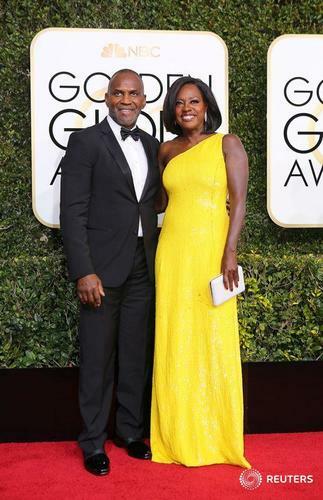 Viola Davis won as expected for playing a downtrodden wife in the African-American family drama "Fences," the movie version of the award-winning play by August Wilson. "It's not everyday Hollywood thinks of translating a play to screen. It doesn't scream moneymaker, but it screams art, it screams heart," Davis said. Netflix's British royal drama "The Crown" beat fantasy "Game of Thrones" and sci-fi series "Westworld" for best drama series, and brought a win for Claire Foy for playing Queen Elizabeth. "I think the world could do with a few more women at the center of it," Foy said of the British monarch, who has been queen for more than 60 years. Hip hop show "Atlanta" won best TV comedy series, beating old favorites including "Veep" and "Transparent."